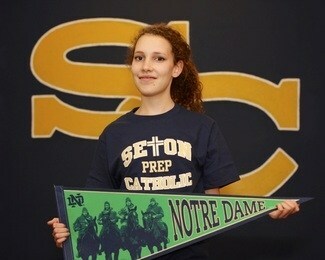 Welcome to the Seton Catholic College Prep Alumni page! We encourage you to check in here periodically to stay informed of alumni news, summer internship and job opportunities, alumni events and ways that you can support Seton Catholic. It is also a great way for you to keep in touch with your alma mater and your alumni family after graduation. Please keep us updated! We would love to know where you are, what you're doing and anything else important. Please email Lisa Farrell at lfarrell@setonhigh.org﻿ so we can keep you informed of news, get-togethers, and opportunities. You should be receiving regular e-mails from us. If you are not receiving these updates it may mean that your contact information is incorrect or out of date. To update your information or to notify us of a big event, such as any awards you receive at your University, new job, or a really cool experience you recently had, e-mail lfarrell@setonhigh.org. We always love to hear from you and find out what you've been up to. Make it a great day and Go Cougs!